The fast, precise and controlled topical skin adhesive. LiquiBand Optima Topical Skin Adhesive has a unique winged applicator with precision tip for accuracy and control, delivering excellent cosmetic results. Precision Applicator - The precision tip delivers accurate application, making the device ideal for traditionally difficult areas. The in-built flow control wings allow the clinician to easily control the volume of adhesive applied. Quick 10 Second Dry Time - rapid wound closure in approximately 10 seconds offering faster patient turnaround. Only one application required for strong and secure closure. Ambient Storage - can be stored between 5 degrees Celsius and 25 degrees Celsius reducing the need for refrigeration. Microbial Barrier Protection - adhesive acts as a protective waterproof barrier, allowing patients to shower without compromising the wound closure. The waterproof, microbial barrier reduces the risk of infection. No-Sting Adhesive - provides comfortable closure, minimising trauma ' ideal for children. Outstanding Patient Benefits'- excellent cosmetic results combined with minimal discomfort throughout treatment and healing. Pre-Assembled Unique Winged Design - ready-to-use straight out of the box. To activate the device, simply squeeze the wings until a cracking sound is heard. The transparent reservoir provides visualisation of remaining adhesive throughout the application process. 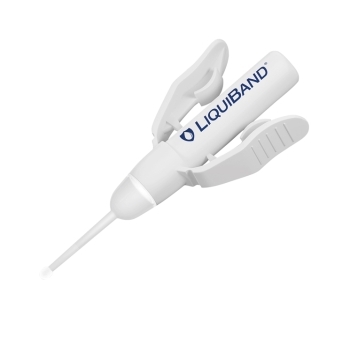 Fast, precise and controlled skin closure LiquiBand Optima is ideal for use on a range of acute wounds including scalp and facial lacerations.